The Democratic Republic of Congo (DRC) has been experiencing internal conflict, war and instability for many years. Recently an International Rescue Committee survey has found that 5,400,000 people have died from war-related causes in the DRC since 1998. The town of Bunia has been the field of several battles between various rebel factions. Many killings have taken place and this has left thousands of widows and orphans. Most of them are not in a position to meet their most basic needs, the children are suffering the most. Local families have accommodated these needy children but they are not in a position to assist them fully. They may be able to offer them shelter and food but cannot afford to send them to school. Some families are not even in a position to provide for the needs of their own children as the war has left them destitute. For the orphans the only alternative is to live on the street. The church is overwhelmed with needy people and the community is increasingly concerned with the many homeless children that are turning to crime to survive. The Rehema Ministry selects needy orphans and vulnerable children within the church setting in the town of Bunia and provides them with education assistance. This involves paying their school fees and supplying books and uniforms. These children will live with their respective parents or caregivers who will provide for their other needs. In addition to education assistance, Rehema also follows up with the school in regard to their academic progress and maintains contact with their respective churches to get information on their spiritual growth. Once a month they bring the children together for a time of fun, bible study and counselling. By enabling these children to receive at least a basic education they are investing in their future and offering them hope. George and Jacqueline Atido are originally from Bunia. They fled the area at the height of the unrest and became refugees in Kenya. In September 2007 George gained a position as a full time lecturer at a bible college in Bunia. The bible college sent him back to Nairobi to complete his doctorate so they have been based in Nairobi for a number of years. When living in Bunia they were involved in pastoral ministry with the local church and in this role they met many people with problems. They were particularly moved by the number of children who were unable to go to school because of lack of finances. These children are mainly orphans or come from destitute family homes. This situation led the Atidos to look for a way to assist these children however they could. As their capacity was very limited they initially just took one ten year old girl into their home and they provided for her education needs. However, there were many other children begging to be helped. This was the start of the Rehema Ministry. 'Rehema' is a word from Swahili that means 'compassion'. BHW's Field Director first met George and Jacqueline when they were working at another of our partnerships in Nguluni, Kenya in 2006/07. At that stage they were refugees. In 2008 George made contact with BHW telling us about the Rehema Ministry and, after communicating with him for 18 months, we commenced our partnership with them in 2010. 1) Orphans or children from destitute families. It will also provide support to the parents and seek to empower the whole family through education assistance for the children. 2) There are a large number of students at the bible college that cannot really afford to live in the city, they come from rural villages. Some of these families will also be assisted. The Rehema Ministry works in close collaboration with the churches from which the children are selected, with the schools where the children are studying and also with the parent/caregivers of the children. They have a real love and concern for the children they care for and a real desire to help these children out of their poverty-stricken lifestyle. They are also encouraging and strengthening the children spiritually. George and Jacqueline Atido coordinate the ministry. Jacqueline has a Diploma in Education and George a Bachelor in Education and MA Missions. He graduated from Nairobi International School of Theology in 2005 and then served with Nguluni Bible Chapel as a missionary for two years before they returned to DR Congo. George will complete his doctorate in Nairobi in 2015 and they will then move back to Bunia and he will become a full time lecturer. They have three children. George and Jacqueline have two assistants who help coordinate the ministry, local church leaders are also involved. In the long term they would like to start up their own Christian school for vulnerable children and also for children whose parents are able to pay for their schooling. In the short term they are focusing on helping parents pay for school fees, uniforms and books for needy children and working with the church and parents to implement this. - In the philosophy of the ministry, needy children are those who have been forced to discontinue their schooling because their parents were not in a position to pay for their education (school fees, uniforms and books) or children who are studying but are struggling to meet these needs. They include orphans, abandoned children and neglected children. Needy parents are the victims of war, widows, single parents, the disabled, the sick and student parents who are not in a position to provide for the basic needs of their children or are experiencing difficulties to educate their children. The budget to attend school in Bunia is US$155 per child ($120 for tuition, $20 for uniform, $10 for books and $5 for administration). BHW's budget will enable 60 children to attend primary school plus have a small allowance for other administration expenses. Baraka is a 15 year old boy. When the war broke out in 2002 his parents fled from a nearby village as Bunia was safer at that time. However they had to face many challenges trying to live in Bunia and could only just afford to poorly feed the children by securing casual work. As a result the children had to discontinue their schooling. Baraka is the first born in the family and it is concerning that at 15 he has only completed schooling up to standard three level when by now he should be in secondary school. 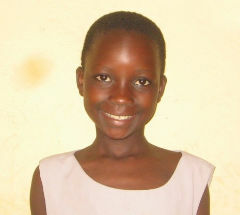 Rehema Ministry will now renew the hope of the family and provide for Baraka's primary school fees. Solange is a 10 year old girl. 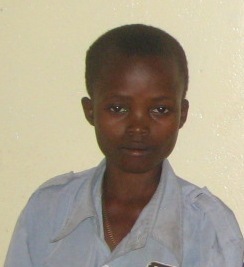 She was the only daughter of a young couple living in a village near Bunia. Both her parents were killed during the war and she went to live with her grandparents who are poor farmers. 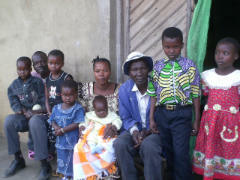 They first fled to Bunia in 2003 for safety reasons but quickly realised that they could not cope with living in a town. After a short stay they decided to return to the village where they are currently living but found that their house had been burnt by a rival tribe and their farm completely looted. The village has a school where Solange can study but the grandparents cannot afford to pay her school fees. Rehema Ministry will be a great help for this family. Zawadi is an 8 year old boy. When rebels attached the town of Bunia in 2003 people fled for safety. His mother (who is still unknown) was unable to run and carry him even though he was just 6 months old and so abandoned him on the way. A Christian nurse who was running in the same direction with his family found the baby and asked his wife to take care of Zawadi despite the burden of their own 6 children and the critical context of war. 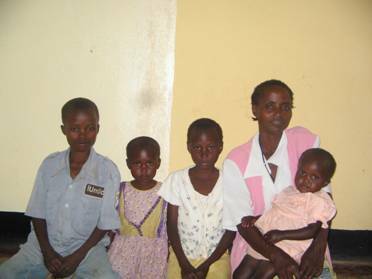 This family provided for Zawadi's needs but recently the nurse died and his wife is now in a difficult situation. She is struggling to educate all these children from a small business in the market. 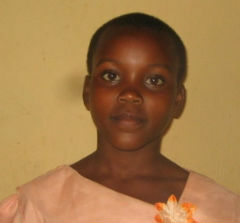 Rehema Ministry is looking to lighten her load by paying for Zawadi's school requirements. 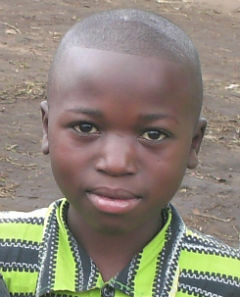 Clement is an orphan and the last born in a family of three children. He is 7 years old. Clement's father died in 2004 during the war. He was then taken along with his siblings to live with their uncle as is the local custom. However the uncle died after just one year and the children had nowhere to go. The local pastor's wife had an extended family relationship with the children and so she convinced her husband to welcome them into their family even though they already had four children. This was a huge load for the pastor but he found himself obliged to assist as nobody else could take care of these children. They initially sent all the children to school but were unable to afford all the fees so Clement, as the youngest, had to stop school and stay home. 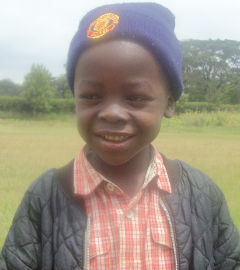 Rehema Ministry will now provide the financial support needed so Clement can return to school. 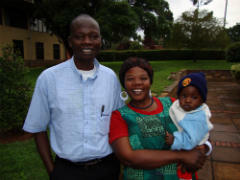 Sifa's story is the one that inspired George and Jacqueline to commence Rehema Ministry. One evening a lady came to visit them. She told them she had four children, all girls, of whom Sifa was the oldest (8 years old). During the war, her husband found himself in a position where he was not able to provide for his family anymore so he disappeared. Nobody knows where he went or whether he is still alive. Providing for these children was now her responsibility but as she only had a small business selling fish she was not able to care for all of them. She sent the two middle children to live with her parents. Her major concern was Sifa as, at this age, most children end up on the street if they are not in school. She was afraid Sifa might end up in trouble but she was not in a position to be able to send her to school. She asked George and Jacqueline if Sifa could stay with them as their maid and if they could pay for her schooling. George and Jacqueline were filled with compassion for that woman and her daughter. They had no desire to use this young girl as a maid but did accept her into their family and have been providing for her education needs.